In order to customize your exercise heart rate, follow the instructions below to find your Resting Heart Rate. 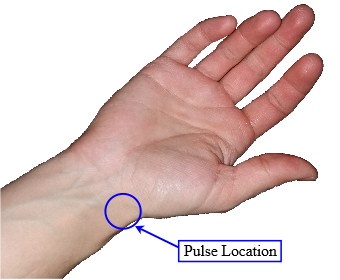 Taking your index and middle finger, and pressing lightly, find your pulse on the wrist at the base of the thumb (see image). Starting with zero, count the beats of your pulse for a total of 60 seconds. It is best to do this first thing in the morning, before your feet have hit the floor. Otherwise, make sure that you have been sitting in a chair for at least 30 - 60 minutes. Now, calculate your custom heart rate range for optimal results while exercising.